Atsuko Okatsuka is a standup comedian, actress, and filmmaker. She is the co-founder of Dis/orient/ed Comedy, the first ever all Asian, mostly female standup comedy tour. She has performed on Comedy Central Presents: Stand Up, Asia! and opened for Margaret Cho at The famous Wiltern in Los Angeles. I’d rate my childhood at a 4 because while it wasn’t completely traumatizing, I did move to the States without my knowledge that we were staying here. My grandma told me we were coming to the States for a 2 month vacation and then we overstayed our Visa. So there was that. And also, my mom’s schizophrenia made life a wee bit difficult to navigate at a young age. But hey, I’m now an American citizen. Just in time for what’s his name to be President. What a blessing. I used to jump on opportunities to break awkward silences or tensions in rooms, particularly during tense family gatherings. If I was able to make even one person at the table break out into a smile or laughter, I felt that I was doing my job as a sort of mediator. So at a young age, I knew there was joy in wanting to be some sort of funny person/performer. My grandma who raised me is supportive for the most part. For her though, the ideal situation is that I continue having gigs like my community college or high school teaching jobs while I continue doing comedy and performing “on the side.” My mom too. But, as I continue to perform at bigger venues and receive bigger opportunities (i.e. Comedy Central taping, being written up in LA Weekly, etc. ), they approve more and more of me doing comedy. Family reactions are very predictable… yet we’re trained to be scared & surprised when they feel disappointed. Haha. Wow I really don’t know. A motivational speaker? But a funny one. I’m silly. This feels like a trick question but if you’re asking if I make people laugh in real life, yes. I live for it. This is our time! Get out there. And if you’re pursuing comedy, I’d love to sit down and talk you through it or help you in any way I can. Atsuko will be performing on Saturday, February 11, 2017 at 7:30 pm at the Japanese American National Museum. Click here to buy tickets. I decided to ask them all 8 questions. Next up is, Joey Guila. Joey Guila has been featured on VH1, G4 Tech TV, Showtime and was the headliner on The Filipino Kingz Tour. In 2003 he won the regional “Kings Of Comedy Search” competition. Joey also has hosted two TV shows on Myx TV called That’s My Jam & Myx Rated which won a Telly Award. I would rate my childhood a 2, almost perfect except my Pop was a Playa! Growing up in the 70’s was amazing, I miss eating Chicken Adobo and watching Soul Train. 2. Tell us about the moment you knew you wanted to be a comedian. When I was 23 I was diagnosed with cancer, while going through treatment I used to watch stand-up comedy and remember how great I felt by just laughing. I told myself when I’m healthy and in remission I would love to pursue comedy and spread healing laughter. My Mom was very supportive, she was happy to see me doing what I love. My Dad was like…. you sure you want to be a comedian and not a playa? Probably a chef, I believe food prepared with love is another way of connecting with people. I enjoy bringing a lil bit of laughter with me where ever I go, to brighten up a stranger’s day is what I love. My fiance calls it flirting when I’m joking with the ladies at Starbucks, but then says its a blessing when we get a free Latte. I guess you can call me the Barista Mac Daddy. I was asked to donate my time to perform at a hospital, but when I got to the lobby there were four rows of senior citizens and a microphone. They thought they were there for a diabetes support group. The coordinator said, “Today we have a better treat for you, we have Joey.” All I heard was an angry old man yelling, “Who da hell is Joey”… and without thinking I said “Yo Mama.” I felt bad, I gave him a hug after the show and we shared a donut on the down low. 8. 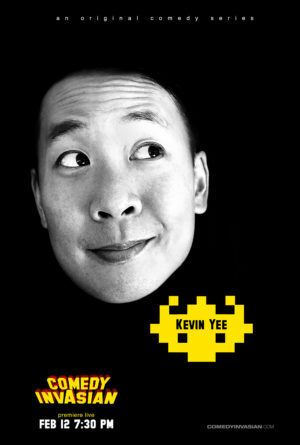 What advice would you give to young Asian American comedians? I would ask them why they wanted to be a comedian or an actor, and if I heard the word “passion” or “happiness” in the answer I would just say continue to do what you love. Joey will be performing on Friday, February 24, 2017 at 7:30 pm at the Japanese American National Museum. Click here to buy tickets. I decided to ask them all 8 questions. Next up is, Amy Hill. Amy Hill’s television and film credits number over 150. She is recently recurring on “Crazy Ex Girlfriend”, “UnReal” and “The Great Indoors”. She’s a regular on Amazon Prime’s “Just Add Magic” which is currently streaming the first season and is set to release seasons 2 and 3 early next year. In the midst of my childhood, I thought it was HORRIBLE. My mom was an immigrant Japanese war bride with thick accent who insisted on putting Japanese food in my lunch. I went to an all-white elementary school with a white collar population. My dad was blue collar Finnish American with a mid-western Finn attitude and accent who struggled to keep a job. We were super poor and I was shunned by most kids and disliked by some teachers due to the my mixed heritage. As I grew older and learned how the others lived, my parents and my family was closer to being All-American than any of the others. Thus, I give my childhood a “1”. After moving to San Francisco to study theater, it was the heyday of improv and sketch comedy and I fell in love with it. My parents were always supportive. I think they were concerned that we might not succeed in life, being biracial, so whatever we did was great. I think I’m funnier in real life because life is so hard!! I don’t do stand up. I don’t do stand up. I’m going to heckled?? Nobody told me!!! Don’t do stand up, you’ll apparently be heckled!! Amy will be performing on Sunday, February 26, 2017 at 7:30 pm at the Japanese American National Museum. Click here to buy tickets. I decided to ask them all 8 questions. Next up is Robin Tran. A 4. My dad was (is?) an alcoholic. My mom suffered from undiagnosed depression (until the past few years). My sister constantly berated and abused me. My earliest memories are eight people living in a tiny two-bedroom apartment (my parents, sister, me, aunt, uncle, and two cousins) and I had to share a crib with my cousin. We lived in poverty. My dad constantly threatened to leave the family. Etc. You get the idea. I was watching Chris Rock’s “Bigger & Blacker” and it was the most inspiring thing I’d ever seen. The special that made me feel like I can actually *do* stand-up comedy though was Louis CK’s “Shameless” from 2006. 4. If you weren’t a comedian, what would you have been? Either a men’s rights activist or dead lol. I’m very funny in small groups of 2-4 people. Very shy in groups of 5 or more people. I used to wear a fedora in college because I really wanted to excel as a straight white guy but I ended up being none of those three things. Don’t let anybody tell you that you can’t do it. Representation is increasing. Watch shows like Fresh off the Boat to be inspired. Also, you’re unique, so always remember that. A lot of people will give you advice as to the *one way* there is to make it. “Get up this many times a week.” “Don’t do this or that or you’ll burn bridges.” All I can say is, figure out how to “make it” your own way, because everybody has a different road, and everybody has different goals/destinations. Don’t fall into the trap of trying to impress your comedian friends. Branch out outside of your local community. Use the Internet and social media to increase your following. And lastly, take a break when you need to. Robin will be performing on Saturday, February 25, 2017 at 7:30 pm at the Japanese American National Museum. Click here to buy tickets. I decided to ask them all 8 questions. Next is, Paul PK Kim. Paul “PK” Kim (PK stand for Paul Kim and Preacher’s Kid) is a regular at The World Famous Laugh Factory in Hollywood. He was the Grand Prize Winner of The Uncle Clyde’s Comedy Cup at The Pasadena Icehouse sponsored by H2F Productions. A 4. Only Asian in all majority white elementary school. Only Asian in white little league team. Really skinny kid with Sora. Raised in extremely conservative Christian family. 6th grade. Friends Cassette tape what was taboo to listen to. Eddie Murphy. Delirious. They knew when they came to my Pasadena Ice House show when I was 33 and my dad past away soon after he came to the show. They weren’t happy but they said if you’re going to do it then do it all the way. You in a library with Will Farrell and Bobby Lee’s face. That’s it. A guy said I need more drinks. I said go get it then. It didn’t end well. BE DISCIPLINED. Or you’re wasting your time. Be focused. PK will be performing on Friday, February 10, 2017 at 7:30 pm at the Japanese American National Museum. Click here to buy tickets. Green Card: A New Musical takes on immigrant artists and the American dream in a new musical from young director Dimo Kim. Playing at Theatre at St. Clement’s until August 26, it focuses on the story of Han, an actor and a South Korean immigrant living in Harlem with an expired visa who, as a result, can’t find work. And because he can’t find work, he can’t get an artists visa. Hijinks ensue. Han finds himself entering a fake marriage for a green card with Mia, in exchange for a sizable sum of money. They fumble through immigration interviews and the turmoil of a new relationship, fake or not. As to how Han’s girlfriend Kim feels about it? You’ll have to watch to find out. This is an energetic musical with young talent and carries a relevant and provocative story in need of telling. Back this March – Friday, March 18th to Sunday, March 20th, I had the good fortune of being able to attend the first ever Silicon Valley Comic Con. I’ve always wanted to go to Comic Con in San Diego, but it seems that year-after-year, tickets for the conference get harder and harder to get. I had only heard about the event a few weeks prior to the show – applied for a press pass online, and shortly afterwards, received confirmation for press credentials. What got me really excited was the fact that there was going to be a “Back to the Future” (BTTF) panel with Michael J. Fox, Christopher Lloyd, and Lea Thompson. BTTF is one of my all time favorite movies, so I was pretty excited to possibly attend. I was able to attend all three days, but not all day – Friday evening, Saturday and Sunday afternoon. Overall, I had a great time – though I thought the convention hall was a bit crowded and the event could have been a bit more organized (the organizers were aiming for 30,000 attendees but announced after the conference that there were over 60,000 attendees over the three days), but hiccups were to be expected since this was the first ever Silicon Valley Comic Con. Overall, I had a blast and look forward to attending Silicon Valley Comic Con 2017!